The Festival will be a celebration of the best traditional food, music and art from countries around the world at Civic Center Park. 30+ food trucks and restaurants, 20+ live cultural performances, vendors, beer garden, DJ’s and live interactive art leading up to a benefit concert from 4-8pm. 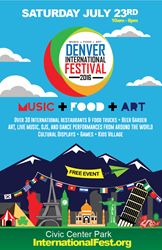 The Denver International Festival will be a celebration of the best traditional food, music and art from countries around the world at Civic Center Park. This family friendly festival is free to the public and features: 30+ food trucks and restaurants, 20+ live cultural performances, vendors, beer garden, DJ’s and live interactive art leading up to a benefit concert from 4-8pm. The festival will also include cultural displays, games, health and wellness activities, and a Kid’s Village. The Denver International Festival will not only be the city's largest celebration of global art, music and food but will also give back to less fortunate communities in Colorado and around the world. This year’s benefit concert will support PROJECT ANGEL HEART, a non-profit organization who delivers nutritious meals at no cost, to improve quality of life for those coping with life-threatening illness. Attendees will have several ways to experience cultures from around the world. Live salsa music, African drums, and Reggae music are just a few of the featured musicians. Multicultural performances include Brazilian Samba, Hawaiian Hula dancing, Shaolin Kung Fu, Indian Bollywood dancing and Middle Eastern Belly dancing to name a few. Guests will indulge in delicious dishes from Europe, Latin America, Southeast Asia, Africa and more. In addition, there will be live paintings from Denver artists, interactive murals and games for the family throughout Civic Center Park. Kids are sure to have a great time inside the Kids Village featuring engaging and collaborative activities making learning about cultures from around the world fun. Activities include archaeological digs, face painting, balloon animals, bouncy houses, art stations and meet & greet with live Star Wars and Disney characters from 10am-6pm. The Denver International Festival has received an overwhelmingly positive response with more than 20,000 Denverites interested in the event on Facebook, over 50 vendors confirmed, and more than 25 live performers booked. For more information please visit our website at http://www.InternationalFest.org or give us a call at 720.319.8441.